I was told that I could not eat anything after midnight and could drink water, black coffee, or apple juice until 2 hours before I was to arrive at the hospital, meaning 5:30 am for me. I had hoped to get in one last little yoga session the night before my surgery, but my intestines were hurting too much for that, so I rested on my couch for most of the evening and then ate some chocolate and almond milk at 11:45. My week of preparation for the surgery, marked with anxiety and chores, had all but come to an end. I was about to enter a new phase of the unknown- one in which I was giving someone else control to cut into my body without me knowing what was happening, hoping that the damage would be minimized. I had no idea how long I would be immobile or what level of pain I would be in. The only thing I knew was that I wouldn’t be able to do most of the things I had been accustomed to doing. Simple tasks would no longer be easy. Life after surgery is very different than life before surgery. I lied down in my bed for a little nap, setting my alarm for 5:15 so I could sip some water before the surgery. I took a shower, got dressed, and took a picture of my knees, knowing they would never look the same again. After a bit of last minute cleaning, I picked out a book to put in my bag, put on my coat and headed out to meet my landlord, who agreed to drive me to the hospital. (He works in the administrative offices there). I piled my crutches into the backseat and quickly brought my trash out to the bins. David had been listening to the radio and said that traffic was already heavy. People were returning to school and work after the recent snowstorm shut most places down the past two days. My seat was pitched uncomfortably forward as a result of his kids playing and I couldn’t easily figure out how to set in back. Within 20 minutes, we hit standstill traffic. “Is it usually like this?” I asked. David said yes. “So early?”. I was thankful that this was not a part of my daily routine. “Yeah. Pretty much.” I knew I wasn’t going to make it by 7:30. I wondered if the surgeon ever got stuck in traffic as well. Maybe he would be late, too! I couldn’t fathom how they always managed to be at the hospital, no matter how much snow was falling. I decided to call the hospital and tell them I was stuck in heavy traffic, but would be there as soon as possible. I sent a quick text to Checka, who was picking me up after the surgery, to let her know where she should go. And then my name was called. 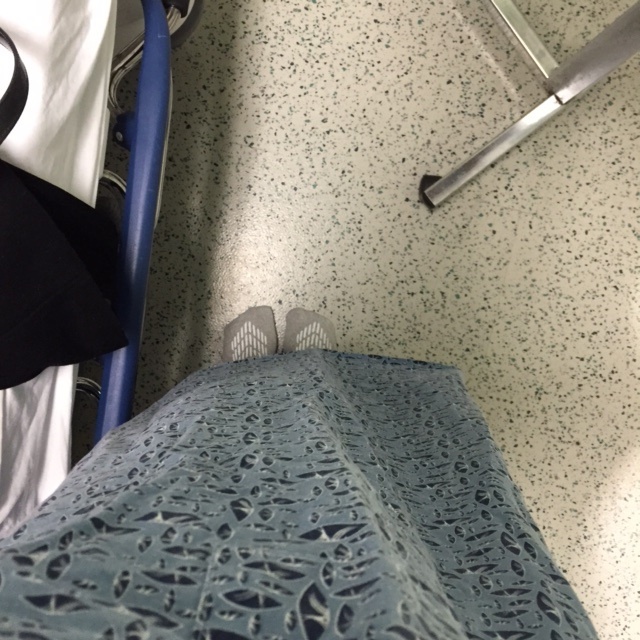 I gathered my coat, bag, and crutches, and was led into the pre-surgery room.A nurse said, “I’m Wendy” to me. “You’re what?” I asked her, confused because all day yesterday, during my numerous pre-op appointments, I was called by my formal name, which I absolutely hate, and repeatedly asked to tell them my name and birth date over and over and over again. I expected this woman to call me by the same name and was taken by complete surprise when she said Wendy. She repeated that her name was Wendy. “I’m Wendy, too!”. From then on, we got along splendidly. She took me to my station, gave me the pink bag for my belongings, gray hospital socks, and a johnny I was supposed to change into. “It will be much too big for you. I’m sorry about that.” She asked if anyone was waiting for me. I told her no, and asked if she could call my friend when I was finished with surgery. “Of course!” she replied. I remember being in my recovery station after my jaw surgery for a long time and finding out that my friend Erik was not even on his way to the hospital yet. It made me upset knowing I would have to wait at least another hour for him. She told me to take my time changing and pulled the curtain closed as she left. Her words and demeanor put me at ease. I slowly changed into my johnny and piled my clothes into the bag. Then, I remembered that I could climb into the cot and relax. I tucked my johnny under my legs and placed the thin blanket over my body, remembering that Erik was with me for this part during my last surgery. So far, I was doing just fine on my own. I looked at my socks and wondered why one was looser and went further up my shin then the other. Hmmm. I listened to the people talking in the stations next to me. On my left, was a man named Milan. And on my right, someone entered the curtained area, announcing that he was a shaver. “You’re going to shave me?” the patient exclaimed. When Wendy returned, she took my blood pressure and temperature, and measured my oxygen levels. She then asked when I last ate and drank something. “You’re the perfect patient!” she said. She asked if I was experiencing any pain other than my knee. I paused and thought. “You’re funny,” she said. I remembered my intestinal pain last night and told her about that. She asked if I could still go through with the surgery. “Oh, yeah.” She kept calling me sweetie and even called me pumpkin at one point! This was all I needed to feel happy. She told me that several doctors would be coming in to ask me questions. The first to appear was the physician assistant. He proceeded to tell me everything that could go wrong during the procedure. “There is a small chance you could die from the anesthesia, the nerves and muscles could be damaged, your pain may not be resolved… Sound good? You still in?”. “Repaired?” he asked, eyebrow slightly raised. “Fine. I’m having it torn out.” He asked me if I had had previous surgeries and how I responded to anesthesia. “Are you going to jam sticks up my nose? Because that’s what they did to me last time I had surgery and I was still awake! It hurt SO much!”. My heart sank. Neither situation was favorable. He stared back at me blankly without saying a word. I felt like crying but didn’t want to in front of him or right before I entered surgery. Instead, I held it in and asked him if he could be gentle with me. A smirk formed on his face. The anesthesiologist, still flipping through the binder, smirked back at him. “I’ll try to be gentle with the tissues,” he said. The anesthesiologist smiled at him. I laughed because I assumed it was a joke (there still was no trace of a smile on his face), but to me, it wasn’t funny. Someone WAS number seven and eight… and one and two…”. I asked if he could tell me what had happened during the surgery afterward. “I have another surgery to get to and you won’t even remember what I say at that time,” he quickly retorted. I felt even more despondent. “I’m going to write “yes” on your left knee.” He then slipped out the curtain and walked away. My contented feeling was gone. The anesthesiologist walked over to my left side and started the IV in my forearm. He said that his assistant would also come in to see me. A brusque woman with a patterned surgical cap came in next. She looked as though she was about to shake my hand, but reached for the hand sanitizer instead. She told me that she was the operating room nurse. So far, Wendy was the only person who treated me kindly, and I wished she could look after me during the surgery, as well. The OR nurse asked me when the last time I had eaten was. Why do I have to answer these questions over and over again? Someone wrote it down the first time! She wanted to check to see that the surgeon marked the correct knee and was a bit annoyed that I had wrapped the johnny under my legs. She said that is most common. Wendy came back in and I told her I wished she could be my OR nurse. “Oh, no” she said. “I’m an ICU nurse! The OR is not my thing”. “Will you be taking care of me after the surgery?”. She said yes, which provided me with at least a little relief. June came back with the news that there was a misunderstanding. By “down my throat” he just meant part way down. I still might get a sore throat from it, but it wouldn’t be the full breathing tube. Thank goodness! She pulled her iphone out of her scrubs to call the OR. (Isn’t that unsterile?) No one was answering. “I know there are at least 2 people in there! I told her there was no reception in here. She tried again, waiting and waiting as it continued to ring. She came back and said they told her the phone wasn’t working. The anesthesiologist came back in and said someone needed to take my glasses. An envelope was found. He adjusted my IV and then, one on either side of me, said it was time to go. They wheeled me down the hall and into a large room, where several people were busy at work. It was very cold in there! A woman quickly pulled back my johnny and placed an even colder metal electrode on my chest. “It’s cold in here!” I said. No one responded. “Is anyone else cold?” I asked after a few more moments. I wondered how they could work under such conditions. “I am!” the anesthesiologist answered, which made me feel better. Someone said they would put some more blankets over me after they finished placing the electrodes on me. “Okay,” I said. That seemed reasonable. 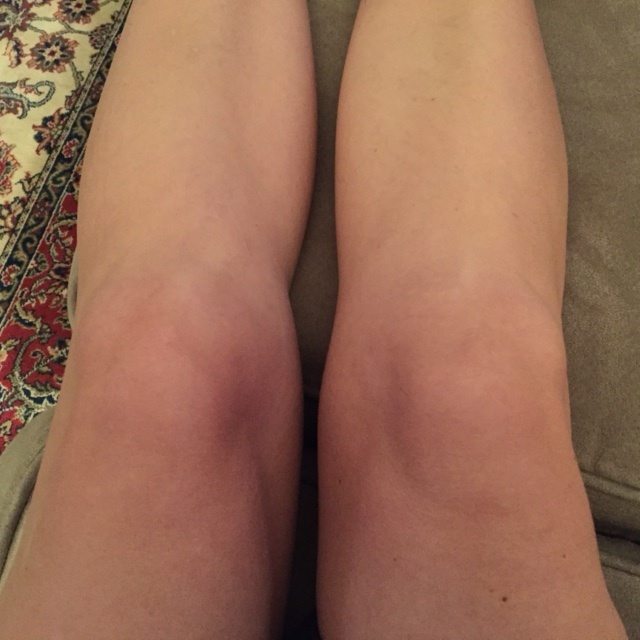 This entry was posted in Uncategorized and tagged medial meniscus tear, meniscus removal, meniscus surgery by Wendy. Bookmark the permalink.